Should you rely on instinct? Or data? Or historical patterns? Or what other people do? Or educated guesswork? If you are leading a business, or ideas, or you’ve got responsibility to get something achieved, then you are having to make tens of thousands of decisions every day. Most decisions are small and inconsequential. 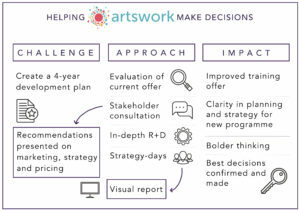 Other decisions could accelerate or block growth, can open up or close doors, can lead to creative and happy teams or instead anxiety and suspicion. Your decisions determine your mission, your values, ethics and your successes – and even what success means. Your customers, audiences and investors watch your decisions closely – and are making decisions about you. But none of this needs to be scary. We provide information, expertise and guidance to people we believe in – entrepreneurs and creatives, local government leaders, business executives, community collectives, scaling enterprises, charities, think tanks and networks. Decision-making involves understanding your own biases, confidence, emotions, interoception, motivations and skills. When you know how you make decisions – you can make better ones more often. We’ll help you be practical. Gathering and processing information, consulting with stakeholders and stepping-back to review all options. We can open your ideas and connect you to influencers and decision-makers, ensuring that you and your team now where you fit, where you can go, and how to manage that position. Your decision-making skills are the most important asset you and your organisation has. We’ll help you make the most of them. We have tools to build confidence and clarity, so that you can be sure the decisions you make are the right ones. By working across sectors, we find the best ideas and adapt them for your setting. always possible provided us with first class project coordination that was meticulously organised, to a high standard and undertaken in tight timescales. It has truly been a pleasure to work with them and we look forward to future collaborations. always possible has been the backbone to our business. Their flexible approach to support has been vital to us continuing to grow and develop. A fantastic organisation who take time to listen and understand your business needs. The speed at which always possible have been able to offer clarity and insight to issues that we hadn’t been able to tackle by ourselves is remarkable. My business is at a crossroads and I feel I am about to jump off a very big cliff. Kate quickly got to the heart of some of the challenges I face and with some gentle questioning really made me think about where I am going. She made some great suggestions and I already feel well supported.